Show your support for the survivors in your life. Pay tribute to those lost. Sky Lanterns are perfect for any occasion. Sky lanterns create a magical moment that everyone loves, whether young or old. You can light one and see it fly into the sky, or even hundreds at a time. Best of all, they’re perfect for daytime or nighttime use. Sky lanterns can rise a mile or more and fly for miles in whatever direction the wind goes. They will continue to rise and fly until the fuel pad goes out. Then they float gently down to earth. They are very simple to use. First, you gently open them up, shaking the paper gently as you do. Then you light the cardboard fuel pad. This is very easy. Then you hold it right side up while the paper balloon fills with hot air. When they’re ready to go, you just release them, and off they go. Our sky lanterns are biodegradable: thin tissue paper, bamboo and a little piece of wire, which will rust away. Nothing harmful going into the environment. Sky Lanterns are also called UFO Balloons. That’s because many people who see them flying do not know what they are, and assume they’re seeing a UFO or some other phenomenon. 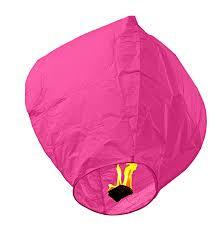 Sky lanterns (called Khoom Fay in Asia) were originally invented in China as a military signaling device. And they have been traditionally used in Asia ever since. Now sky lanterns are becoming extremely popular in America. They are used in all kinds of events from weddings to funerals (as wish balloons where guests write something on sky lanterns and release them). Surprise your guests at backyard cookouts, weddings, parties, or any festive affair. Give each of them a sky lantern of their own to light, and you will delight them with something very special and unusual. That’s because even though sky lanterns are soaring in popularity, most people have still not seen them in person. You’ll be the hero of the party, as they oooh and ahhh.